50 Cent is a multi award-winning, multi-platinum-selling American rapper and occasional actor from Queens - real name: Curtis Jackson. He was discovered by Eminem in 2002, and signed to Interscope Records. 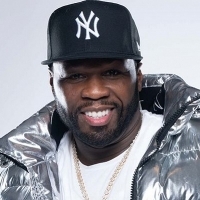 His debut album was the "unreleased", but heavily bootlegged "Power of the Dollar" in 2000, followed by the award-nominated, multi-platinum "Get Rich or Die Tryin'" (2003), plus "The Massacre" (2005), "Curtis" (2007), "Before I Self Destruct" (2009), "Animal Ambition" (2014) and 2015's "Street King Immortal".